While a move to 4% for US Treasury Yields looks likely this would not necessarily mean an interest rate low would be in place, according to Ron William and Robin Griffiths, strategists at RW Advisory. William and Griffiths point out that reversal patterns have formed for US yields: The lows in 2012 and 2016 form a large double bottom, of which the 2016 low itself was made up of an inverse head and shoulders (see Chart 1). They think these patterns indicate rates are likely to reverse and breakout of their long-term downtrend channel. The neckline of the latest reversal pattern is at 3% and if this neckline is broken then William and Griffiths predict a rise to at least 4%, with risk of a spike higher. However, William and Griffiths say it would not necessarily mean that the absolute low for rates would be in place. 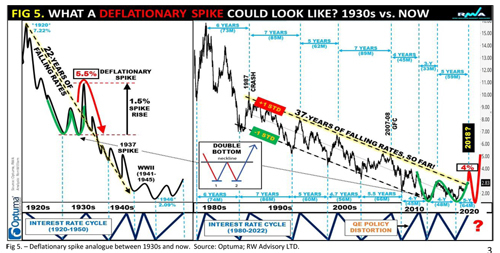 They point to what happened after the1929 wall-street crash where a similar double bottom pattern eventually led to a spectacular deflationary spike in 1931 (see Chart 2). This was followed by new lows as the depression got deeper. For now, however, William and Griffiths believe that rates will rise powerfully whilst the economy is strong.